I had some time to bake, and since we had a few leftover frozen peaches and some ripe nectarines, I wanted to make some muffins. I found this recipe, and improvised a little. They turned out ok, not quite as flavorful as I had hoped. Maybe if the fruit had macerated in some sugar for a bit, then added to the batter it would have been better. The pork and fruit salsa is a staple at home during the summer. 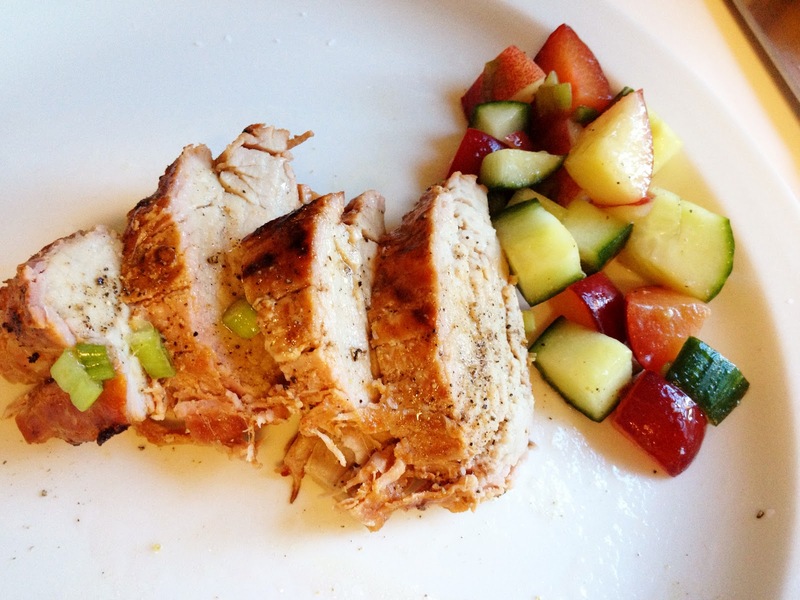 We always keep the fruit for the salsa in the fridge most of the summer, and pork tenderloin is always a favorite. My mom happened to marinade the pork this time in a chipotle marinade, but I have no idea what she put in it. So, I'll just give you the fruit salsa recipe. It goes with pork anything, so if you're having pork in the summer, make this salsa/salad! You may want to make extra just to munch on. *I can't find the exact recipe I used, so this one will have to make do. Looks very similar. 1. Preheat oven to 375 degrees. Grease a 12-cup muffin tin or line with paper cups. 2. In a large bowl, whisk together the flour, baking powder, baking soda, cinnamon, ginger, and salt until well combined. In a separate smaller bowl, whisk together the eggs, buttermilk, brown sugar, melted butter, and vanilla extract. Pour the wet ingredients into the dry ingredients and stir with a large spoon until just combined (make sure to scrape all the flour up off the bottom of the bowl). Mix in oats. Gently fold in the diced nectarines and peaches. 3. Divide the batter between the 12 muffin cups (a mechanical ice cream scoop works great for this) – they will be almost completely full. 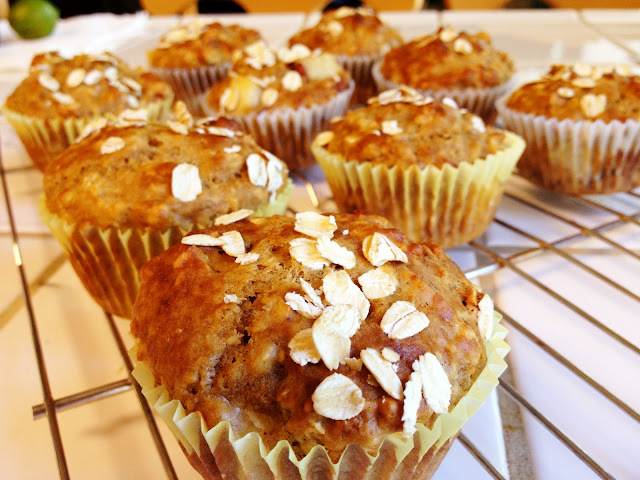 Bake at 375 degrees for about 25 minutes or until a toothpick inserted in the middle of a muffin comes out clean. 1. Mix together oil, vinegar and sugar in a bowl. 2. Put cucumber, nectarine, and plum(s) into the bowl with the dressing. (If you have too much fruit, you can always double the dressing recipe.) Mix in some green onions. Stir. Serve with pork tenderloin. Season with salt and pepper.